Announcing our next Starts ONLY Workshop to be held at Tufts University’s Hamilton Pool. Tufts is a great teaching pool with large Paragon starting blocks which are perfect for a great learning experience! This 3+ hour clinic will be a very complete walk through of the many concepts and theories behind what prepares you for, and allows you to execute a great start on any type of block. We will also have live video analysis during the workshop, and a very low coach/athlete ratio for an extremely personal learning experience. We will also have live video analysis during the workshop, and a very low coach/athlete ratio for an extremely personal learning experience. We will teach a unique approach to a Catapult (track-style) Start. **We will not be doing backstroke starts. If you have interest send us a message on link below. Announcing our next series of Small Group Workshops to be held at Tufts University’s Hamilton Pool. This workshop will be a complete walk through of the many concepts and theories relating to how each individual’s body balances and moves through the water when doing push-offs, streamlines and transitions to the surface. These are very important concepts for a swimmer to be aware of at any age. Learning how their specific body reacts to the “gravity of water” directly relates to each individual’s positioning in all of their strokes and streamlines. These are great workshops for all ages and levels of team swimmers. If you have interest send us a message below. Please include their age and swimming experience. 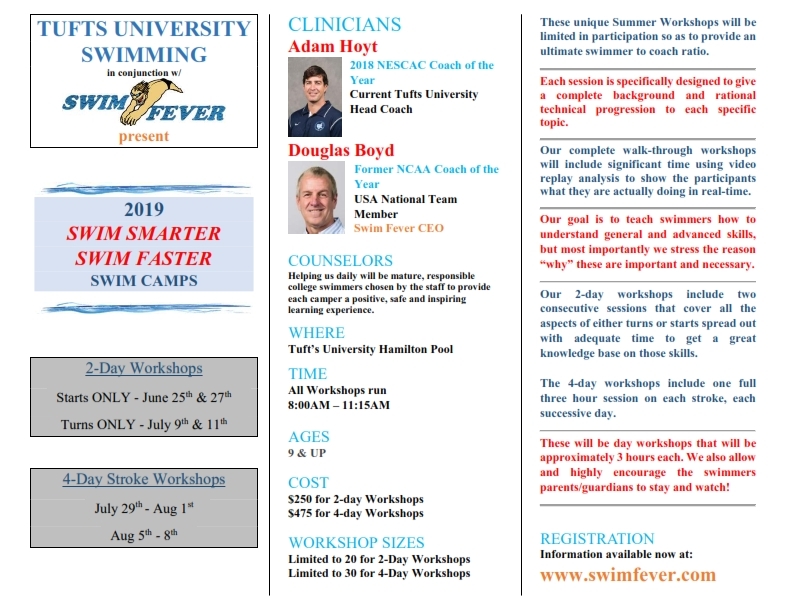 Swim Fever’s workshops provide an excellent and unique opportunity for a great learning experience in small groups with unusually high coach to swimmer ratios. One of the best learning tools athletes have at their disposal are different opinions. There are many different ways to explain the same process. Just as with an academic tutor, sometimes it takes a different way of teaching the same subject to get the process to “click in” for that particular individual. At Swim Fever, our workshops are designed to give a complete background and rational technical progression to the topic at hand. Our complete walk-throughs usually include significant time using video replay to show the participants what they are actually doing in real-time. At Swim Fever, we use the most up to date HD video equipment and analysis software to offer a unique and Complete Video Analysis for Competitive Swimmers. We will show you what is actually happening when you swim. One of the most useful tools you can have as an athlete is to actually SEE what you are doing when you move. Relating between what you feel you are doing in your swimming to what you actually see you are doing is the one of the most important variables in successful Stroke Shaping™. Whether it be in a private 1-on-1 session or group/team setting. Swim Fever can help you compile that information edge you need to improve all aspects of your swimming.